While the Kepler Space Telescope mission officially came to an end on 30 October 2018, starlight data recorded by the observatory continues to reveal new and intriguing exo-solar system objects. Among the recently-announced discoveries from Kepler data include an exoplanet of unusual size and the first potential exomoon around an exoplanet. The big question at the time of the Kepler Space Telescope’s launch was how prevalent exoplanets were in our nearby swath of the galaxy. While exoplanets were already known to exist, their prevalence was still a mystery. Part of the problem prior to Kepler was a lack of dedicated ground-based assets that could be – for lack of a better term – commandeered for long enough periods of time for the prolonged observations needed to gain a realistic understanding of exoplanet numbers and distribution. To find and confirm exoplanets, direct observation of stars over multiple months and years is necessary in order to identify exoplanet candidates either by the transit (when an exoplanet passes between its parent star and the telescope causing an observable drop in light) or radial velocity (measuring the gravitational tug or wobble on a star from an exoplanet) methods of detection. In short, the astronomical community was in desperate need of a dedicated telescope that could be placed in a stable orbit to perform prolonged observations of a single patch of stars over multiple years. Enter the Kepler Space Telescope, a mission designed to function in an Earth-trailing orbit around the Sun and conduct precise, ultra-sensitive light curve measurements of the same set of stars in a single patch of sky for at least three years. At the time of launch, mission scientists were quite up front about what they expected Kepler to reveal to them: they didn’t know. 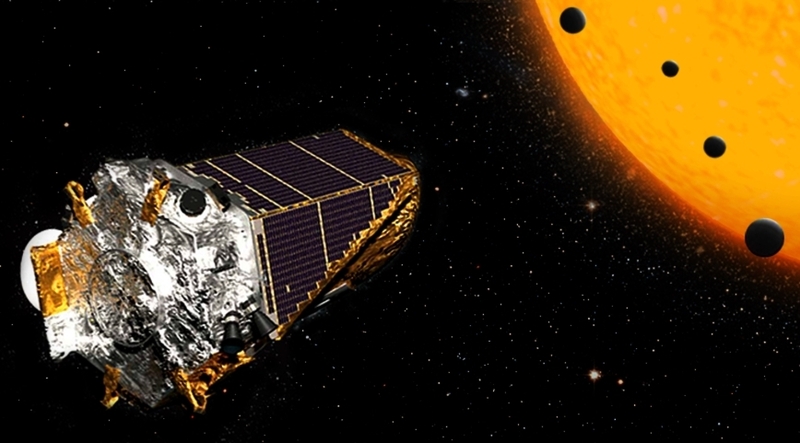 Kepler was a completely revolutionary mission that carried the real possibility of returning information that exoplanets were uncommon and that are solar system was unique. But as many suspected, Kepler proved the exact opposite. As of publication, Kepler has been responsible for the confirmation of 2,336 exoplanets with an additional 2,424 candidate exoplanets still awaiting confirmation. With these numbers, Kepler is responsible for the discovery of 60% of the total number of known exoplanets – which stands today at 3,891. Even though Kepler’s mission ended months ago, it will take years if not decades to examine the immense wealth of information the telescope collected over its nine and a half years of operation. Therefore, it’s not surprising that Kepler continues to reveal exoplanet and astronomy discoveries that are helping scientists better understand our exosolar neighbors and the stars they orbit. One of the exciting things about the data returned from Kepler is quite simply the amount of it; but with these observations have come surprises, like the Fulton Gap. Of all the exoplanets observed in close orbits of their parent stars, there is a surprising lack of exoplanets in this category with sizes ranging between 1.5 and 2 times that of Earth. This void is known as the Fulton Gap. But K2-288Bb might be the break astronomers have been hoping to find. With an estimated size of 1.9 times Earth and with a close orbital period of just 31.3 days, K2-288Bb resides firmly inside the Fulton Gap. 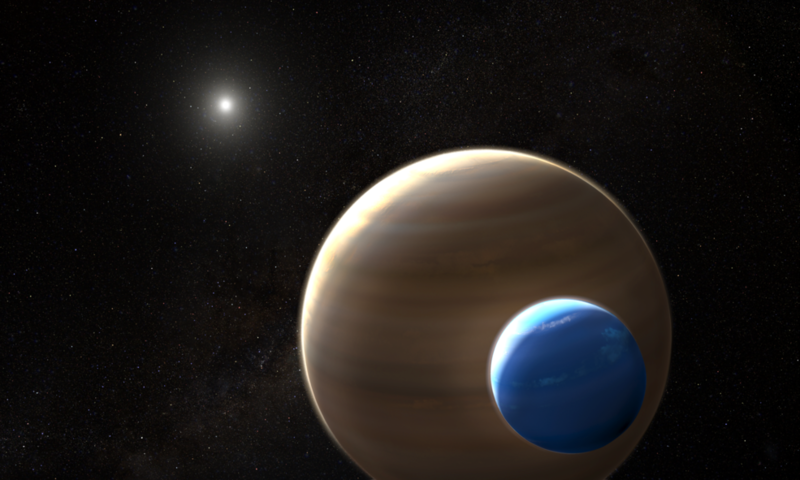 The exoplanet is either a rocky super-Earth or a gas-rich Neptune-like planet located 226 light years from Earth in a binary M-type star system – the two stars themselves separated by a distance roughly equal to that between the Sun and Saturn – and orbits only the smaller of the two stars. But confirmation of K2-288Bb’s existence was almost missed due to peculiarities in the data obtained by Kepler during the second phase of its mission, known as K2. During K2, Kepler periodically reoriented itself to examine different patches of the sky, and this reorientation caused slight temperature differentials and telescope orientation changes; to get around the effects these anomalies had on the light information obtained by Kepler, scientists largely ignored the first few days of data gathered during each new K2 campaign. This directly relates to K2-288Bb because the exoplanet was detected using the transit method, a detection technique that requires three transits for confirmation. The tricky part was that only two transits were detected during the K2 observation of this portion of the sky. But as the K2 mission progressed, scientists using the K2 data created better ways of dealing with the anomalies imparted into the data during the first few days of each new observation. These new techniques allowed this portion of data to be refined and filtered and then posted to the web for the public to examine. And it was in this first few days’ worth of previously ignored data that the third K2-288Bb transit resided, a transit found by citizens who flagged it and thus allowed for the confirmation of K2-288Bb’s existence. Moons are a fact of life. Six of the eight planets in our solar system have at least one moon, and dwarf planets like Pluto also possess naturally orbiting satellites. It would therefore follow that exoplanets also possess moons. But the tricky part is that detecting exomoons is much more difficult because of their smaller size compared to exoplanets. When using the transit method of detection, an exomoon will cause an extremely small reduction in the amount of light reaching a telescope. Complicating matters further is that unlike an exoplanet which will consistently cause a dipped in light in a very predictable manner during each transit, an exomoon will not because it will be in different positions around the host exoplanet each time it’s observed. Nevertheless, NASA believes they have found the first exomoon candidate orbiting a super-Jupiter gas giant planet 8,000 light years away in the Kepler-1625 system. The search for this particular exomoon began when astronomers at Columbia University in New York, Alex Teachey and David Kipping, noticed a transit signature anomaly with Kepler-1625b. Identification of this anomaly led to more than 40 hours of follow-up investigation using the Hubble Space Telescope, an observation timed to monitor Kepler-1625b’s 19-hour transit across its parent star. Intriguingly, 3.5 hours after Kepler-1625b’s transit ended, Hubble observed a small dip in the parent star’s overall brightness, a dip corresponding to a location and consistent with predicted light level changes if Kepler-1625b had a moon trailing it in relation to the exoplanet’s direction of travel and Hubble’s observation position. Unfortunately, Hubble’s observation ended midway through this potential exomoon’s transit, cutting off the team’s ability to gather the full range of data desired. 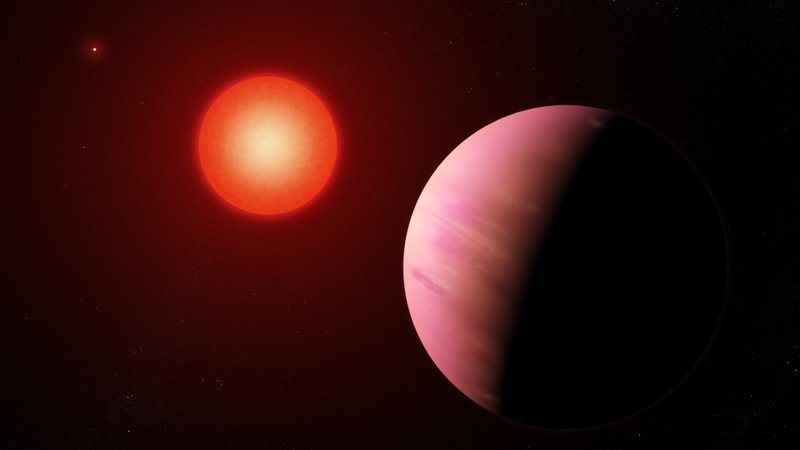 Nonetheless, the Hubble observations provided supporting evidence for Kepler-1625b’s potential exomoon; but researchers caution that more investigation of the system is needed, as the light curve dips could also be explained by the presence of a smaller, second exoplanet in the system that has previously gone undetected. But the team is excited by what they’ve seen so far. “A companion moon is the simplest and most natural explanation for the second dip in the light curve,” Kipping explained. Whatever has been observed trailing Kepler-1625b is quite large – the size of Neptune – and would itself be gaseous. Despite its large size, much larger than what we consider to be a moon based on our solar system, the potential exomoon would be proportional in mass to its parent exoplanet. Current estimates of the potential exomoon show it to be 1.5% the mass of its parent planet, which is itself estimated to be several times the mass of Jupiter. This places the mass ratio between the two in a similar range to the Earth and Moon. While both Kepler-1625b and its potential exomoon lie within their star’s habitable zone, both objects are gaseous and are not candidates in the search for potential life-harboring worlds. But if the existence of this exomoon can be confirmed, it opens the door to a host of considerations in astrobiology – not the least of which being that if gaseous planets orbiting within their stars’ habitable zones contain rocky exomoons, those exomoons might have liquid water on their surfaces and thus might be candidates in the search for extraterrestrial life themselves.